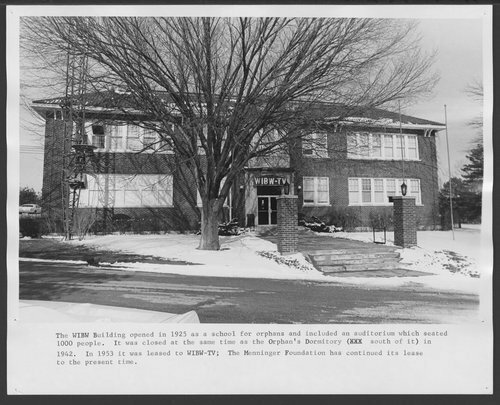 The WIBW Building was constructed as the school for the Security Benefit Association orphans and opened September 1925. It cost $75,000 to construct and furnish. It included an auditorium which seated 1000 people. The Security Benefit Association was an early social security system. There was a model hospital available for the members who paid a nickel a month in fees. That fee also covered an orphanage for their children, if the member died, a school educating those children through high school, and an old folks home, all centered around a model farm in Topeka, Kansas. The school was closed in 1942 at the same time as the Orphan's Dormitory which was located directly south of it on the SBA grounds. In 1953 it was leased to WIBW-TV. The Menninger Foundation continued its lease until the Foundation moved to Houston, Texas in 2004 and WIBW constructed a new building in Topeka. The photograph was taken in 1972.